This George Osborne conference speech at the Conservative Party conference in Birmingham yesterday caught the headlines for its proposed abolition of universal child benefit. And no doubt those headlines will continue for some time. “Conference, I come with good news and bad news. His autocue delivery left something to be desired. But he managed it. In fact there were several stumbles and fumbles as the Chancellor tried to get his words out. But he kept going—he wasn’t thrown. His conference speech made good use of the conference theme, “Together in the national interest.” So, he referenced it four times in this 30 minute speech, often at telling points, particularly in his conclusion. 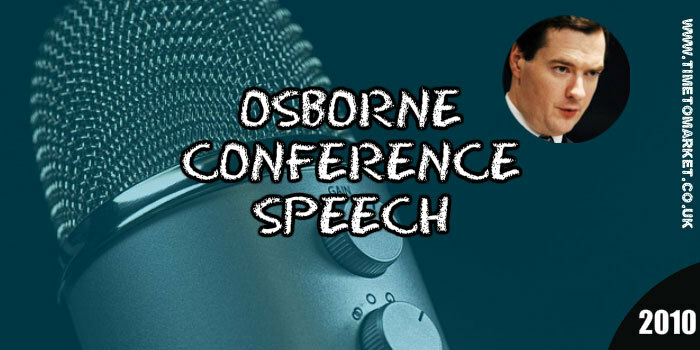 Knowing the serious points that he had to get across in his first speech as Chancellor of the Exchequer didn’t stop George Osborne from trying humour in the speech. There was humour and it was typically directed at the former Government. In this case the Miliband brothers. “Vince Cable and I will do this together. People said we wouldn’t get on, that we’d trade cruel nicknames, that we would knife each other in the back, that we’d try to end each others’ careers . “So they failed to fix the roof when the sun was shining. This particular line was enlivened with the subsequent weather metaphor…but it’s getting a bit stale, now. This George Osborne conference speech didn’t have the rolling gait of an old-time political classic. But it contained key messages for his audience, useful rhetorical devices and some clever jokes at his predecessors expense. “We don’t choose the times we live in. That’s not the canvas upon which my generation has been asked to paint. “A Britain that is a beacon for liberty and justice. There may be moments when we can’t see it. At half an hour this was a perfectly timed speech from the Chancellor. He’s certainly becoming more assured in his delivery as he builds his public speaking experience. And, certainly the Wikileaks story of no conference speech for Osborne is very much passé. You can discover plenty of public speaking tips with our regular series of posts, podcasts and videos. 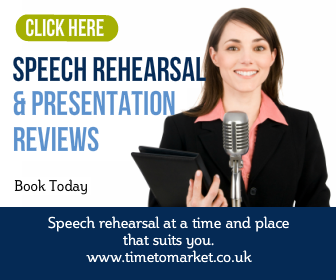 For example, you can discover how to engage with your audience when you use a theme for your speech. 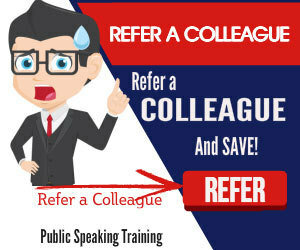 And, when you are ready to boost your public speaking skills even further, then why not plan for training or coaching. We can train or coach you at more than 40 different training centres in the UK. Or, we can run a corporate course for you and your team at your own offices. So, when the time is right, please don’t hesitate to call. As per DNA ( Sept.20,2010 ), British cabinet minister Vince Cable has stirred controversy by suggesting that unemployed young Britons should be sent to India to find work. According to the minister, it was time to end the one-way flow of skilled workers from India to the UK and claimed that British graduates should be able to go in the opposite direction to India where the economy has boomed. And since Google India just announced that it will pay Rs. 100,000 by way of referral fees to anyone who recommends a software engineer ( subject to employment offer from Google and joining ), this opens up another opportunity to Vince Cable. By recommending British software guys to Google India, he can earn their gratitude ( and votes ? ) while simultaneously helping to reduce the budget deficit of Pounds 170.8 billions. Hurry up. Google offer expires on Oct.15, 2010 !